come and see us next year! 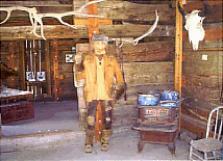 The most well know building at the Little Snake River Museum, the Jim Baker Cabin, housed one of the last great mountain men of the American West. Built in 1873, the home now sits just a few miles from its original site at the base of Savery Hill. At the age of 55, Baker built the cabin completely by hand. When it was constructed, it was one of the only permanent buildings in a land filled with Shoshoni teepees. Baker held close relationships with this tribe and Native Americans throughout the area, even marrying two of the Shoshoni chief’s daughters, Marina and Mary. With these women and his Yantse wife Eliza, Baker fathered 11 children, eight of whom grew into adulthood. Along with being the family home, the house served as a trading post. Also, right before the Meeker Massacre, it acted as a fort for valley settlers. During its brief time as a fort, a third story was added to the cabin to be used as a lookout. In 1898, Baker died in the cabin at the age of 80. Nearly twenty years later, in 1917, the State of Wyoming relocated Baker’s cabin to Frontier Park in Cheyenne, Wyoming. The cabin remained in Cheyenne until Paul McAllister, Baker’s great-grandson, directed its reconstruction and donation to the Little Snake River Museum. Jim Baker, was born in 1818 and died in 1898 and is buried nearby in the Baker Cemetery along with many of his family members and decendents. The Madeline House, also located at the museum, belonged to his daughter Madeline Baker Adams. View the Jim Baker Biography. "Preserving our History for the Valley's Future"
Positions start anywhere from April to May and go through September or October. Days and hours may be flexible.